After the now regular hospital trip Saturday morning we went over to the Nampodong district where a movie theatre was showing Hot Fuzz, which my wife really wanted to watch. 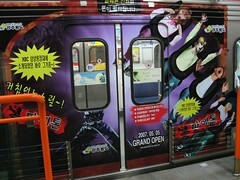 Our subway train was advertising a roller-coaster ride, which might have been more worrying if I was new to the city. 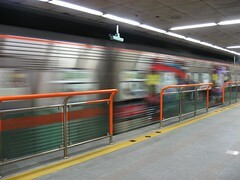 Although I gather that advertising on trains is common in Seoul, it's the first time I've seen such a thing in Busan, where so far the carriages have been as uniform as the trains have been punctual. We arrived too early, and sat in an almost empty foyer on the fifth floor of the theatre doing some Korean language practice. If we'd been doing this since I came here I'd probably be fluent by now, but we've spent our time here rushing from one situation to the next and we don't seem to get many of these pauses in-between the action. A little girl came over and said "hello", but after I replied "안녕하세요" (Hello) back the conversation died and she lost interest. I should probably never teach children. I didn't know what the Koreans would make of something as esoteric as a British action-movie parody, when just being British is strange enough without delving into any sub-genres, and it seemed neither did the Koreans because only ten of them showed up. If you were one of ten people sat in a vast theatre with hundreds of seats, where would you sit? In the centre, or off towards one of the edges? With the Koreans largely sticking to their assigned and occasionally bizarre seating (which we don't have in the UK where it's just a free-for-all), I persuaded my wife, in an undoubted act of cultural pollution, to forego our given positions and instead sit where we wanted. And even though the movie was OK, I laughed more about the absurdity of the Korean instinct to comply with the seating arrangements than anything on the screen. I've little doubt that the film's subtleties will be lost on Korean audiences, but the disturbing nature of English country life left me feeling a little homesick for once, perhaps because I'm very much an English city dweller who can relate to it. 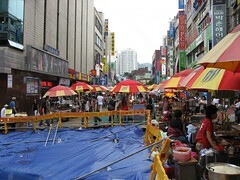 The monsoon rain which had started two days earlier was largely holding off much to the bemusement of the local weather forecasters, but with their sea of umbrellas the street vendors selling their food around Nampodong were prepared for anything, except the Japanese tourists we tried to help translate for while eating mandu at one of the stands. After our snack we headed back towards home where we were meeting up with a friend for lunch proper, which this time was another common Korean dish, donggaseu (pork-cutlet) with rice and vegetables. 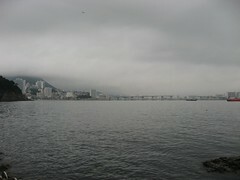 For reasons not entirely clear to me "we" had decided to go to the Songdo district afterwards. On the way we passed some Korean dancing girls bravely trying to entice ajeossis (presumably) into an electrical store, despite the rain which was finally falling. 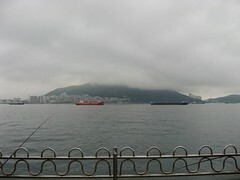 In Songdo monsoon clouds hung angrily over the bay, but the rain held off long enough for us to walk down a road full of people fishing. I've been here once before when it was freezing cold, and I think they fish whatever the weather. 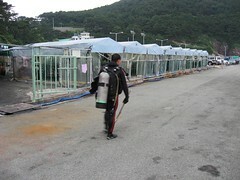 It seems that scuba diving is popular here as well - hopefully anyway. As this diver emerged from the water and trudged by us, my Korean language ability suddenly found itself in time say "북한 사람입니다" (it's a North Korean). Fortunately this time apparently funny, next time maybe it goes the other way and - given the history of uninvited incursions over the years - it turns out to be in bad taste - who says learning the language is a good idea? Unless you want to walk here along the cliffs, the route to the fishing area is by a twisty mountain road that made us car sick on the way back. 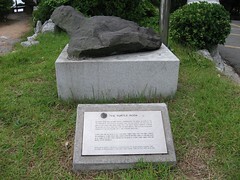 The random point we had to stop at somewhere along the cliffs turned out to have a memorial commemorating the landing of New Zealand troops in Busan on December 31st, 1950, who came to defend South Korea as part of the United Nations army during the Korean War. They stayed near Songdo before going into action. 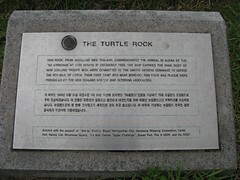 It was dumb luck that we came across it. Coincidentally, Monday was the 57th anniversary of the start of the War. 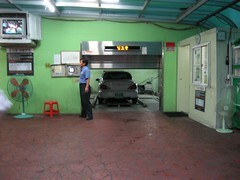 We were heading to a pool hall, and left our car in one of the vertical parking garages that are common in the city, where the vehicles are stacked by lift - space is at a premium here. In my haste to take a photo of this I dropped my camera's spare battery and only discovered this when one of the staff yelled ajeossi at me and threw it in my direction. Great - I am starting to look old. 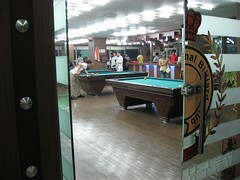 It was my first time in a pool hall here - the fabled hang-out of Korean gangsters, but while my two companions were the only women in there, it seemed a fairly relaxed non-intimidating kind of place. 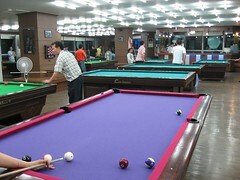 I often used to go play pool until 3am at a place back home while at university, and in comparison this was like a hotel - they had lights and you could see through the smoke. Not quite what was expected. Pool appears to be called 'pocket ball' here which seems a rather odd and generic sort of title until you realise that the other game which is commonly played - a variation on billiards - is played on pocket-less tables - so in that context the 'pocket ball' name kind of makes sense. 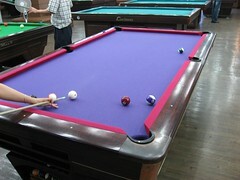 Maybe pocket-less billiards is much more popular as well, because only two of the tables were for playing pool, much to the disappointment of some Russians who came in looking for a table. They didn't stay, so I guess they didn't reckon much to the pocket-less game either. There was some thought that, at 1,200 won for every ten minutes, it was rather expensive, but it seemed roughly comparable to a DVD Bang to me. Back down the building in the elevator, we got out on the wrong floor and found ourselves in a supermarket, where there were even more Russians. 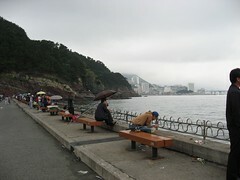 I've gathered that there are one or two areas of Busan which are popular with Russian tourists and the crews of ships which dock here, and I guess this was one of them. It's a cliché but most of them seemed to be gravitating towards the wines and spirits section, although a couple were just buying ice cream. 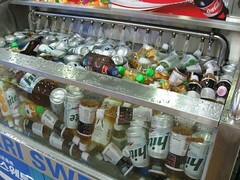 Oddly enough, rather than a chilled cabinet, the supermarket kept its beer chilled in a tank of cold water. Different. So we did some shopping before heading back towards home, where the street vendors were still plying their trade in the dark at nine in the evening. 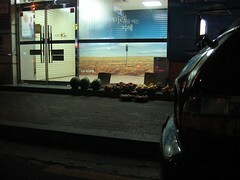 We parked up and headed for a Korean restaurant which specialised in spicy chicken, along the way passing through more street vendors one of whom greeted me with a booming "Hello!" 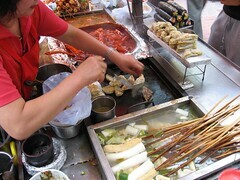 which was met by an equally robust "안녕하세요" (Hello) back on my part - I'm getting used to this. In the restaurant the ajumma owner spotted my pale complexion in the dark and brought me a fork to supplement my chopsticks. I smiled but pressed on with the chopsticks because this is Korea, and yet another of those typical days I seem to have spent as a Korean, living at a Korean pace.